Give that tired, mass-produced hummus a run for the money with a hearty homemade hummus with the smoky red pepper and chili kick of North African Harissa. Hummus will never be the same! After a few weeks in Tunisia, I was inspired to find several ways to use harissa. In my last post, I discussed my re-creation of my spicy egg white breakfast omelet for a quick, healthy, anytime entree with an exotic flair. 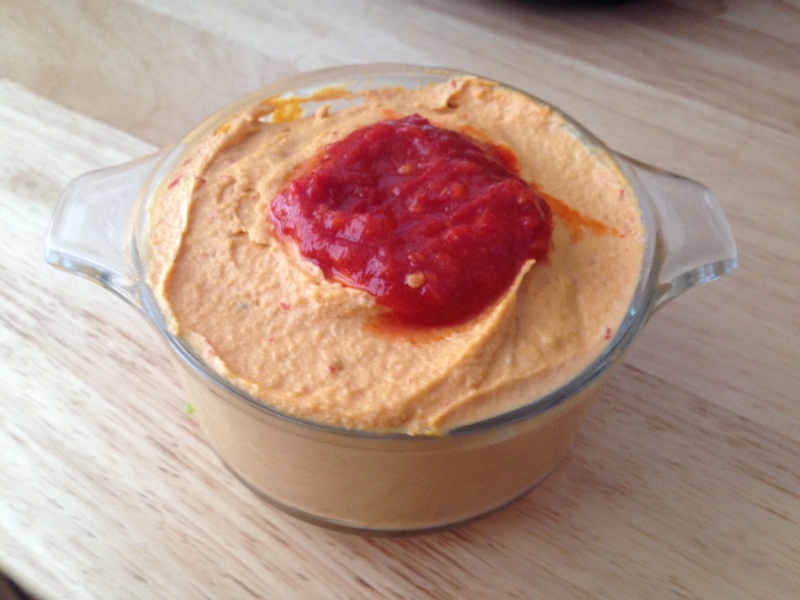 Today, I hope you’ll embrace harissa even more by making fresh, nutritious hummus from scratch. I wasn’t sure how it would turn out, but I stand converted! My aunt and mother first introduced me to hummus when I was a young child, long before hummus and even salsa became mainstream snacks around the world. Unfortunately for me, I hated it then. A decade or two later, I finally acquired a taste for it, so much so that I never again passed on it at home or at my favorite Lebanese restaurants. 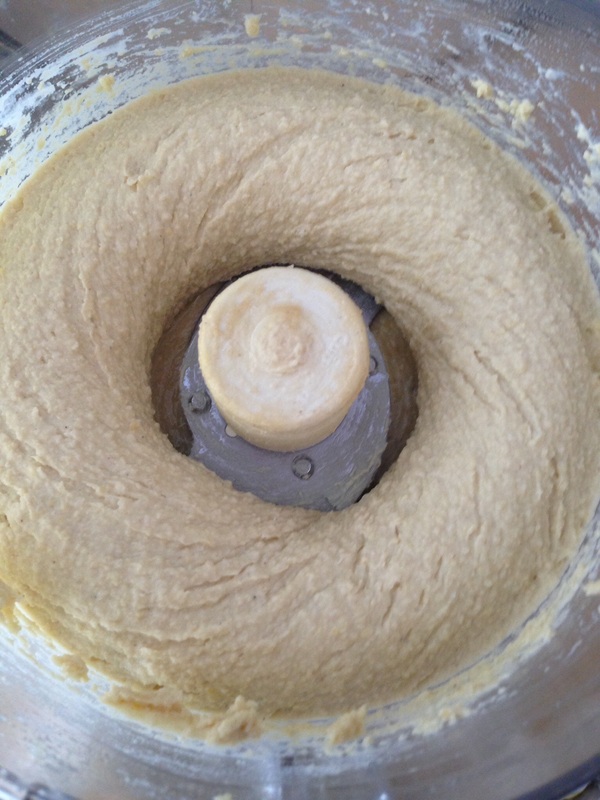 Yet pre-Tunisia, I’d never made hummus from scratch myself. I tried the boxed mixes during college a few times, but out of laziness and a lack of a decent food processor, it took a new Cuisinart processor [I am NOT paid to say that!] and a trip to the Middle East to embolden me. I didn’t want to make just hummus; I had two goals – make it truly from scratch with organic, dried garbanzo beans (chickpeas) instead of canned, and to make it unique and spicy with harissa. You may substitute canned chickpeas for the dried ones of course, which eliminates the need to plan ahead (soaking takes little effort but a lot of time to let them rest, preferably to sprout and release more nutrients, while also making the tough legume more digestible). 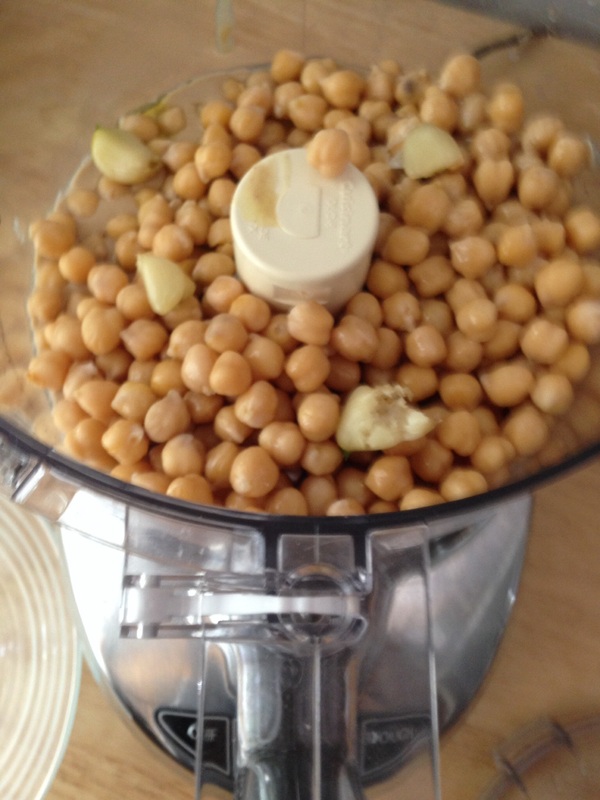 Using dried chickpeas also requires the addition of water to the food processor. You still may need to add water if you use canned chickpeas, but that amount will be substantially less. Make this recipe your own by tweaking it to suit your tastes. I love garlic, so I used both raw and roasted cloves for depth of flavor. I find that lemon juice can really overpower hummus, so I used it with caution. 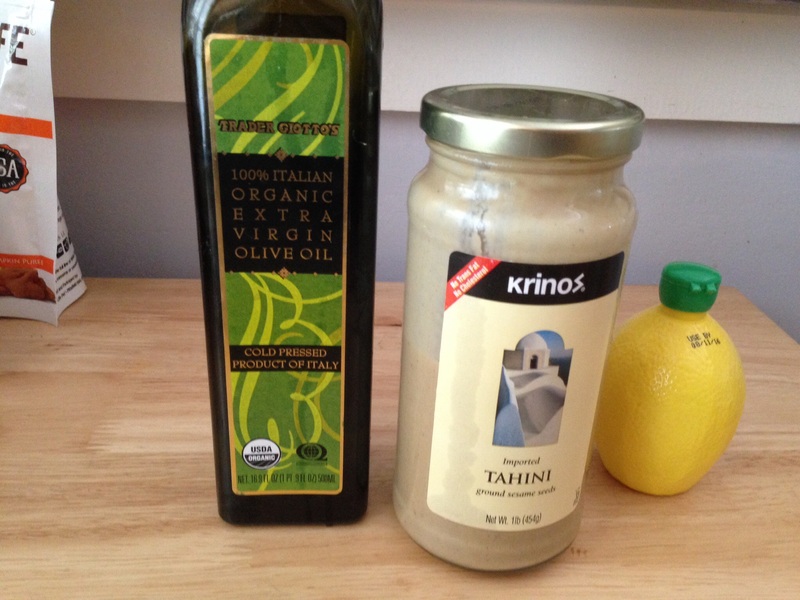 Others may like to add more tahini for its distinctively nutty flavor. Slowly add flavorings incrementally so that you hit the flavor sweet spot for your tastes. Of course, you may substitute cayenne pepper, red pepper flakes, or Asian chili paste or omit the harissa entirely, but it adds a smoky and definitely spicy kick – unless you find and use a mild version. In that event, it’s a shortcut to roasted red pepper hummus. 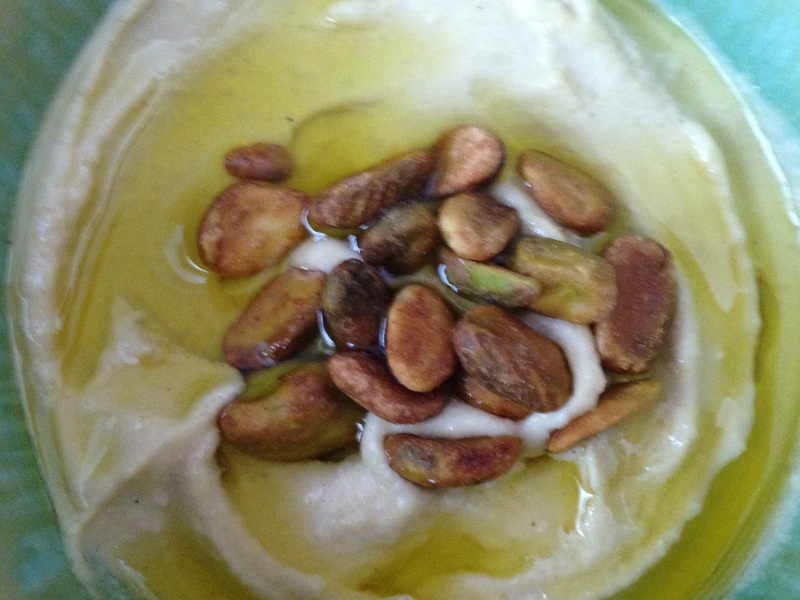 The hummus universe is limited by only your own creativity and the ingredients you choose to use! Soak 1 cup of dried chickpeas in 4 cups water for at least 24 hours up to 72 hours (once the chickpeas have germinated and begun to sprout). Drain and rinse. Bring about one quart (4 cups) fresh water to a boil; add chickpeas and cook for about 15 minutes or until tender (or several hours in a slow cooker). Drain. The cooked chickpeas should amount to about 2 1/2 cups. In a food processor or blender, combine all ingredients except water and harissa. Pulse to incorporate. Gradually, add water to thin to desired consistency. Add harissa (or substitutes) and additional salt to taste if desired. Serve topped with additional harissa, ground sumac, or pistachios as pictured below. Hummus without harissa – great either way!